The food at Barbados' Waterfront Cafe is one of the best-kept secrets in Barbados: Known for its wonderful jazz nights, it deserves as much recognition for its food. Waterfront has become one of my favorite places to lunch with friends. When you’re in Barbados, please eat at Waterfront Cafe. 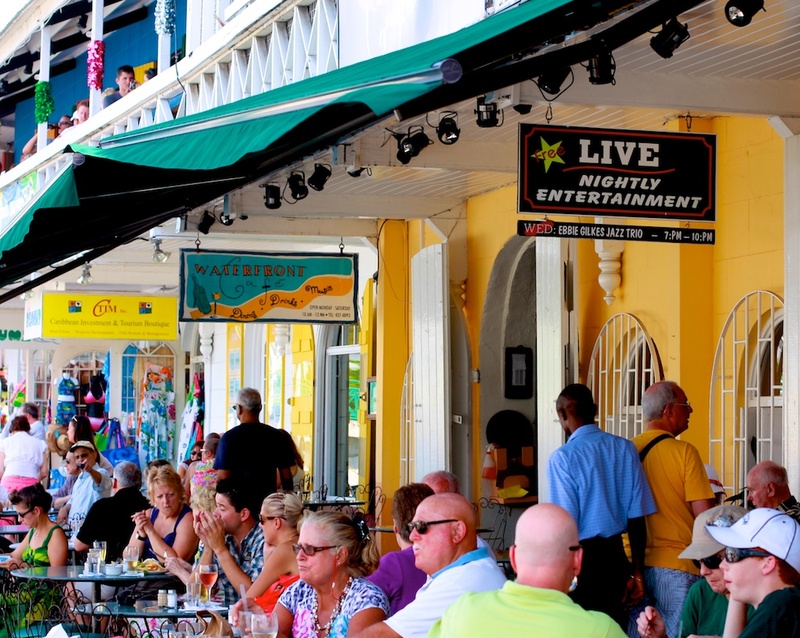 Located in Bridgetown along the peaceful careenage, live jazz entertains at dinner as you dine on fabulous local and regional food in a friendly and relaxed atmosphere. You might even get a free meal, courtesy my husband Greg. We dined tonight at Waterfront with our friends Sharon and Peter … the pepper pot was out of this world and the gazpacho – tops. Veggie samosas, crab cakes, flying fish, coconut shrimp, rum drinks were all wonderfully spiced and beautifully prepared. And the guava with ice cream and carrot cake topping off the meal: delish. Sitting under the stars along the peaceful boat-lined waterway, the nighttime temperature perfect, and soft jazz drifting through our lively conversation — it was a perfect Barbados evening. Yes, definitely go to Waterfront Cafe for lunch or dinner when you visit. Back to the free meal I mentioned …. Now, my husband Greg is a generous soul but I wouldn’t call him a big-spender-throw-money-around type. Although the nice couple who were seated at a nearby table might have that impression. We were just being served our soup when that couple came over and graciously thanked Greg. They seemed like very nice people, an older couple. Greg went with the flow, accepted their gratitude with grace, shook their hands, introduced everyone at our table to them … Then we all shook hands … And, before taking their leave, they once again warmly thanked Greg. I looked at Greg, wondering why they were so grateful to him. Truth was, he didn’t know why. But he learned soon enough because, at the end of our meal, Greg was presented with the bill for our table … along with the bill for the couple at the other table. Both of which he quietly paid. In the car on the way home, I asked Greg why the couple from the other table thanked him. He said he picked up their check. Why? I asked. Well, best he could figure out, he said, when we arrived at the restaurant and asked the employee who greeted us to be sure that Greg got the check for our table, the employee apparently somehow thought that Greg was including the couple from the other table in his largesse. Fortunately, Waterfront Cafe’s prices are quite reasonable. Which on tonight’s visit in particular made us very happy. And we’re also happy – very happy – that there’s a couple out there that thinks that Bajans are super-duper-nice people!